Though it sits just 10 miles off the mainland, Monhegan Island—whose name comes from an Algonquian word that means "out-to-sea island"—feels light years away from the hustle and bustle of the modern world. The island was once known as a prime fishing destination for the native Abenaki tribe, and today this 4.5-square-mile rocky retreat is home to around 75 people (give or take). It’s even smaller neighbor, Manana Island, isn’t inhabited at all. Monhegans’s tiny village is home to a fish market and a few shops, inns, and restaurants, but this isn’t a tourist trap by any means. Monhegan keeps it simple and gives you a chance to slow down: no chain stores, not even a bank—but plenty of inspiring views. Get ready to fall in love with Monhegan Island’s New England charm and rugged good looks. Historically, Monhegan had long been a prime fishing destination. Ready to make your way to Monhegan? The island is accessible only by boat, and you can catch a ride from one of three ports: Boothbay Harbor, New Harbor, and Port Clyde. Since cars aren’t allowed on the island, there are no car ferries, but parking is available at all three ports. 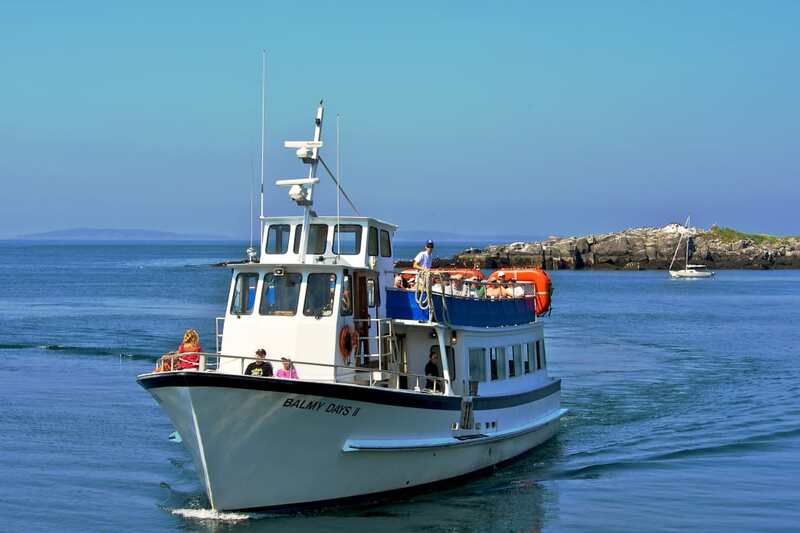 The Monhegan Boat Line departs from the charming village of Port Clyde and runs trips to and from the island at least once a day (more during the busy season from the end of May through the beginning of October) for $38 per adult round trip. The Hardy Boat Ferry to Monhegan departs from New Harbor and takes under an hour. Daytrippers rejoice, this boat gives you five hours to explore the island before returning back to the mainland, plus pets can join for $5! Several outfitters also offer all-day cruises, circumnavigating the island or exploring nearby bays, at an additional cost. The island is accessible only by boat, so make sure to book your ferry through Monhegan Boat Line. If you want to learn more about the history of the island, make the Monhegan Museum of Art and History your first stop. You’ll find it in the Monhegan Light Station, and the museum features an annual art exhibit, artifacts from both the Native Americans and the settlers that later lived there, and information about the historical building that houses it all. 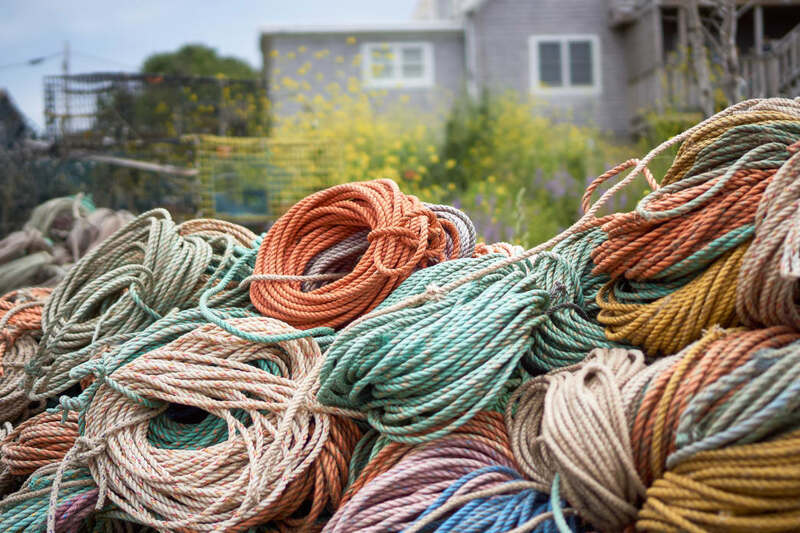 Monhegan is known for being home to a thriving artists’ colony. Drawing creative types from the far reaches of the globe, it’s been a major destination since the mid-19th century. Big names in American art, like George Bellows and Edward Hopper, were among the hundreds who have painted the island’s rocky cliffs and omnipresent seagulls. Local art is on display at several galleries in the village, including the Crow’s Nest Studio and the well-known Lupine Gallery. There’s certainly a lot to see on Monhegan Island, but there’s plenty to keep you active, too. 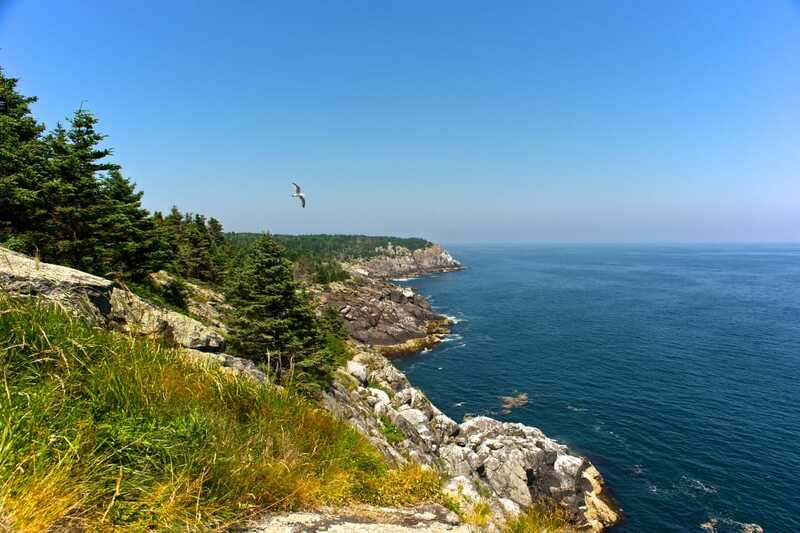 Monhegan Associates, Inc. maintains a 350-acre land trust on the island, which is home to 12 miles of hiking trails. Many of the trails on the island match its rugged terrain: narrow and rocky, often wet, with plenty of tree roots, sheer drops, and the occasional poison ivy—this tiny island packs a wallop in the adventure department. These sea cliffs belong on a postcard, but stay back to avoid strong currents and fierce undertow. Grab a picnic for your pack at The Novelty or L. Brackett & Son. Take the Whitehead Trail (#7) for panoramic view of the headlands (stay out of the water here—tidal currents and undertow make for dangerous conditions). The strenuous Cliff Trail (#1) requires a longer time commitment, but its spectacular views are well worth the trouble. The Gull Trail (#5) is a great opportunity to see the postcard-worthy headlands from sea level. Several shops on the island sell detailed trail maps, with proceeds supporting trail maintenance and invasive species control within the preserve. Sea kayaking is also a popular activity around Monhegan Island, but, like everything else here, it’s on the adventurous side. Surprise ocean swells frequently come in, sometimes capsizing boats, and it can be tough to land on or swim to. If you’re an experienced paddler but didn’t bring your kayak, don’t worry—you can rent one from Monhegan Kayak Rentals. 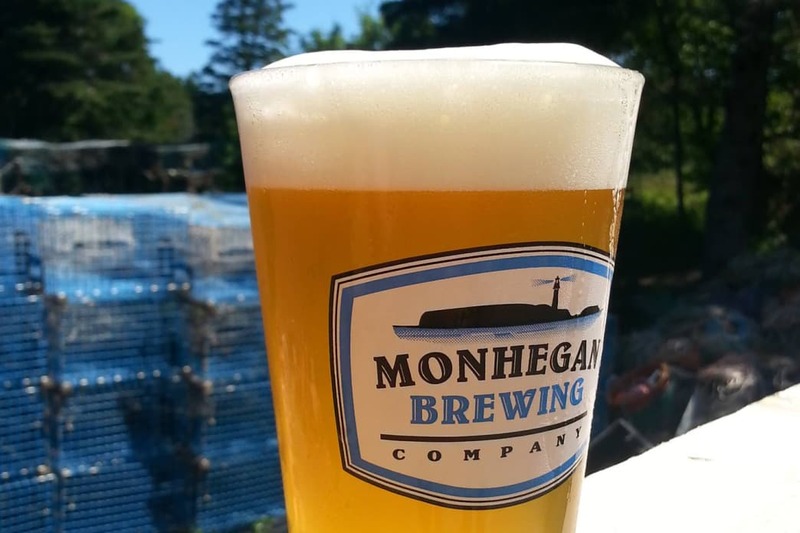 Monhegan Brewing Company is a great place to relax after a hike at Lobster Cove. When you’re ready for a break, head to the village to experience the slow, pleasant pace of island life. Check out several quaint shops, including The Barnacle, which sits right on the wharf. Head to the Monhegan Museum of Art & History, which features special exhibits during the summer months, or relax with a beer at the Monhegan Brewing Company, just shy of Lobster Cove (where you can explore a shipwreck among the rocky shoreline). Whatever you do, don’t miss out on views of the Monhegan Island Light, the second-highest lighthouse in Maine, which has a light beam range of 20 nautical miles. There’s also a museum in the lighthouse keeper’s home that’s open for most of the summer. There are about a dozen places to stay on the island, ranging from quaint inns to seaside rental cottages. Keep in mind that rates vary by season. Plan your trip for a shoulder or off-season to get the most bang for your buck. Written by Emma Walker for RootsRated in partnership with Maine's Midcoast & Islands.